Arrow Films have gone all bloody with historical epic In The Name of the King: Two Worlds, out on DVD and Blu-ray this coming 21st May. Directed by Uwe Boll, best known for such quality output as Postal and Alone in the Dark, it stars action actor Dolph Lundgren of Rocky IV and The Expendables. 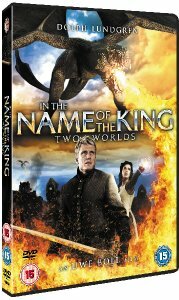 A sequel to In the Name of the King: a Dungeon Siege Tale, it comes with a lenticular sleeve for collector appeal, and is an action-packed fantasy adventure about a modern man finding redemption on an ancient battlefield, or so says the blurb. The DVD will carry a recommended retail price of £12.99, whilst the Blu-ray will set you back a maximum of £14.99. Both are rated certificate 15. Granger is a lethal ex-forces soldier transported back in time to fulfil an ancient prophecy. Summoned to defeat the threatening forces of darkness, Granger finds himself catapulted back to a mystical age where dragons scorch the skies and the only way to fight is in brutal hand-to-hand combat. But as he fights his way to the truth and to get back home Granger learns that one wrong move could cost him not only his life, but the very future of his world.